If you do a Google search using the terms “Joomla + MAMP” one of Joe’s articles in a series of MAMP tutorials comes up as the very first result! Joe’s presentation will be to demonstrate how to download and set up a virtual server on your computer so you can start developing Joomla websites locally on your desktop. You can also expect some great tips on working locally while building those great Joomla sites. 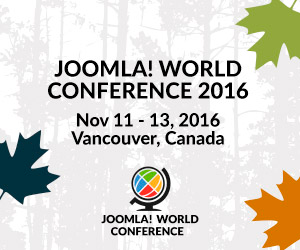 The Joomla World Conference always attracts some of the top developers and personalities of the Joomla community from around the world. This is a great place to get connected and discover the latest news and experience some of the exciting developments of the Joomla CMS. The World Conferences are also legendary for having a great time as well. Why not be there! Tickets are only $299 USD for the event if you purchase them before October 31.